Select a node in the Elements panel, and type $0 in the console to reference it. Tip: if you’re using jQuery, you can enter $($0) to access the jQuery API on this element. In the Elements panel there are 2 super useful buttons. The second one lets you trigger a state for the selected element, so you can see the styles applied when it’s active, hovered, on focus. Click the name of the CSS file that you edited. The inspector opens it into the Sources pane and from there you can save it with the live edits you applied. This trick does not work for new selectors added using +, or into the element.style properties, but only for modified, existing ones. Pressing cmd-f (ctrl-f in Windows) opens the search box in the Elements panel. 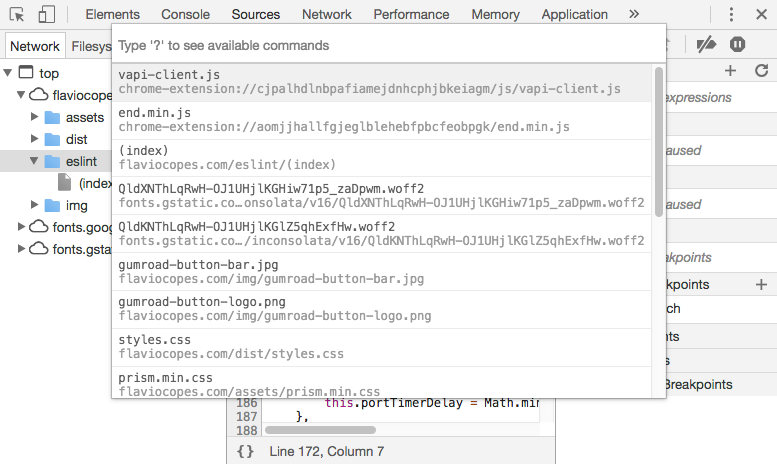 To write commands that span over multiple lines in the Console, press shift-enter. You can clear the console using the Clear button on the top-left of the console, or by pressing ctrl-l or cmd-k.
cmd-o (ctrl-o in Windows), shows all the files loaded by your page. cmd-shift-o (ctrl-shift-o in Windows) shows the symbols (properties, functions, classes) in the current file. ctrl-g goes to a specific line. Instead of writing again and again a variable name or an expression you are going to check a lot during a debug session, add it to the Watch Expression list. From the debugger open the XHR/Fetch Breakpoints panel. 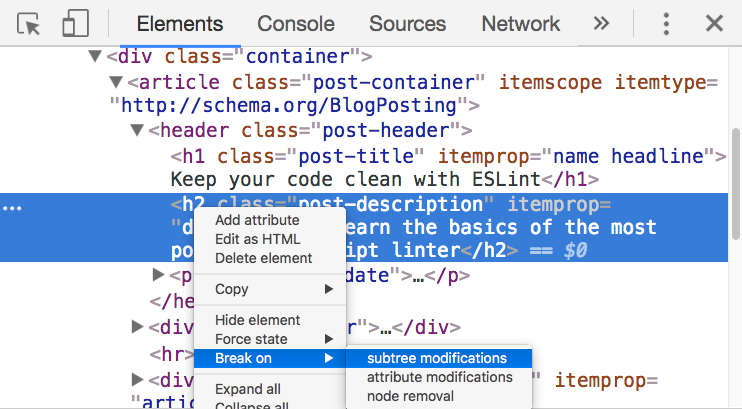 Right-click an element and enable Break on Subtree Modifications: whenever a script traverses that element children and modifies them, the debugger stops automatically to let you inspect what’s happening.